Azalealand offers a number of resources to our residents and families. Thank you so much for accepting my mother, Susie Bunger, as a resident of Azalealand. Our family has had wonderful experience there. From the moment you enter the building, you don't experience the usual "nursing home odor", to the care and attention my mother receives. The maintenance and cleaning staff, the dining staff, nursing services and the "pill lady” as mama refers to, activities, social services, the help I get from Stephanie in the Finance department and management have all been helpful at one time or other. I can't name them all. The quarterly meetings have given us an opportunity to discuss any issues we as a family may want to address , as well as any issues you may want to discuss. I don't think anyone wants to be confined to a nursing home, but if you do I would certainly recommend Azalealand. My Husband started showing signs of memory loss and slowing in his gait over 12 years ago. During those years he became more and more dependent on others to help him with his personal care and eating. This year, he had reached a point that he could not stand on his own nor walk a few steps. His doctors recommended that he be placed in a nursing home. This was a very important decision for me to make; but with careful consideration and recommendations from his doctors, nurses and others in the health care profession, a visit was made to Azalealand and the decision was made. He has been a resident at Azalealand Nursing Home for three months and both of us are very pleased with the care and attention he is receiving. He is in a safe and caring environment with personnel that care. All staff members go out of their way to assist and meet the needs of the residents under their care. They are a hard working, caring and dedicated group of individuals from the Administrators down to every area in the setting; which includes the nurses, CNA’s, activities, personnel, volunteers, therapist, dietary, housekeeping and all that come in contact with the resident. 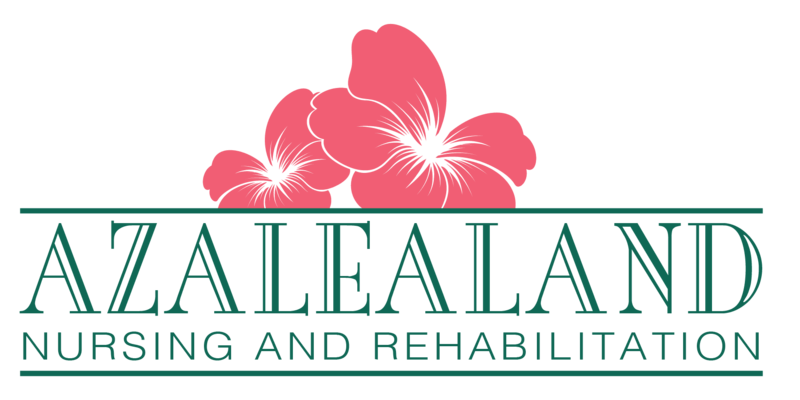 We are pleased with Azalealand's nursing care. Recently, within a span of 10 months, both our mom and dad became residents of Azalealand. Mom, who suffered a mild stroke, received excellent physical and speech therapy and was able to return home after a brief stay. The therapists at Azalealand worked with Mom to help her improve her mobility and regain her speech and cognizant abilities. Mom's recovery was aided by the patient encouragement of the therapists, which enabled her stay to be a short one. Since her return home. Azalealand has continued to be supportive by encouraging Mom to visit Dad as often as she likes. Dad continues to reside at Azalealand. His transition from home to a nursing facility was difficult, but with the patience and gentle treatment by the staff, Dad ﬁnally came to accept Azalealand as home and is content in his place. The nursing and support staff professionally do their jobs, take time to speak with residents, to give them a pat on the back, listen to what they have to say. Since he can no longer be at home, we cannot think of a better place for Dad to be. We accept employment applications year-round and welcome you to submit your information. Although we don’t have any current opportunities, we will keep your application for employment on file and contact you as soon as an opportunity arises.